The very best insurance agents know what it takes to sell insurance. The best insurance agents and agencies achieve superior performance because they follow the 8 secrets below. 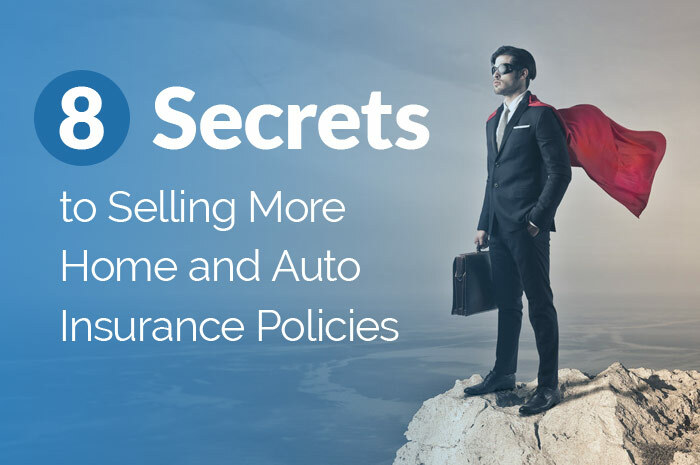 It doesn’t matter if you are an exclusive or an independent agent, as long as you follow these rules, you too can be a success selling auto and home insurance. 1. Be aggressive in everything you do. Selling home and car insurance is hyper-competitive. If you and your team are not going to be aggressive in your sales, managing your team and relentlessly pursuing of new policies, you will not succeed. Being aggressive means having high energy everyday. It means not accepting the status quo and trying new strategies to drive your sales. Being aggressive means never accepting that things are “ good enough”. Being aggressive means buying insurance leads and calls so that you and your agents have zero downtime during the day, evening and weekends. 2. Outwork the competition. If you and your team do not get the sale, it is going to your competition. To be successful, you and your team need to work smart and hard everyday. Get up early, work relentlessly through the day and into the evening. Consumers shopping for insurance have many more options than ever before, especially the most desirable ones. If you don’t reach an auto insurance lead on the first attempt, try again, until you reach them, email them or even send them a text. The days when insurance buyers had few options are gone forever. Remember to follow-up, follow-up and follow-up again. 3. Hire, delegate and hold accountable for results. If your goal is to build a self-sustaining agency, that can out last any one individual, you need to hire staff, train, delegate and hold them accountable for achieving results. You can not do it alone. There is too much to do and too little time. When you have the right people, in the right jobs, you will achieve your desired results. Too many agency owners will hire their friends and/or family for open positions and then not hold them accountable for results. Doing this is a mistake. Set sales targets, revenue goals and relentlessly pursue them. 4. Focus on customer needs and wants. Some agents try to “sell” a consumer what is best for them, rather than what is best for the customer. They will try to “sell” the policy with the highest commission and what they believe will make them the most money. This is shortsighted. Consumers may buy because you “sold” them, but they won’t stick around. You will make less money in the long run because they will switch agents the moment they find a better deal. Always remember to focus on the consumer and that will be rewarded with more sales and longer retention. 5. Have a roadmap to where you are heading with your agency. It is critical that you have individual, team and agency daily, weekly and monthly goals. These goals should be for both new sales and retention. You need to tie your compensation and rewards to achieving these goals. Goals need to be adjusted from time to time and should be achievable, yet also something that you have to push yourself to achieve. If you are over achieving your goals on a regular basis, the goal might be set too low. If you are not achieving it, it might be too high or you might not be working hard enough. Before lowering your goals, you should try harder to see if that makes a difference. 6. Invest in your sales. How do the most successful agencies grow and make money? They are not afraid to invest resources into performance based marketing. They invest in programs that have direct measurable results. They buy car and home insurance leads and calls from leads companies that pre-quality the consumer. They know that relying on “referrals” or word of mouth, to grow your agency is like playing the lottery and hoping to win big. Many insurance agents will reduce their marketing when sales are down, this is the opposite of what they should do. When sales are down, agents should invest more in marketing, not less. 7. Establish and foster partnerships. There is nothing more important that establishing and building a strong relationship with your home and auto insurance lead and call supplier. Many insurance agents approach their relationship with their lead company in an adversarial manner. This is a mistake. Insurance agents should build and nurture their leads supplier relationship to create a win-win situation. When you have your lead company on your side and working for you, you will be more successful. 8. Listen to your prospects, clients, employees and community. You do not know everything. The more open you are to obtaining advice from successful people around you, the more successful you will be. The insurance industry is very dynamic and you should be always looking for ways to work smarter and shamelessly copy those that are doing well. Becoming and staying a successful Insurance Agent takes hard work. It requires a daily focus on your targets and continuous improvement over days, weeks and years. 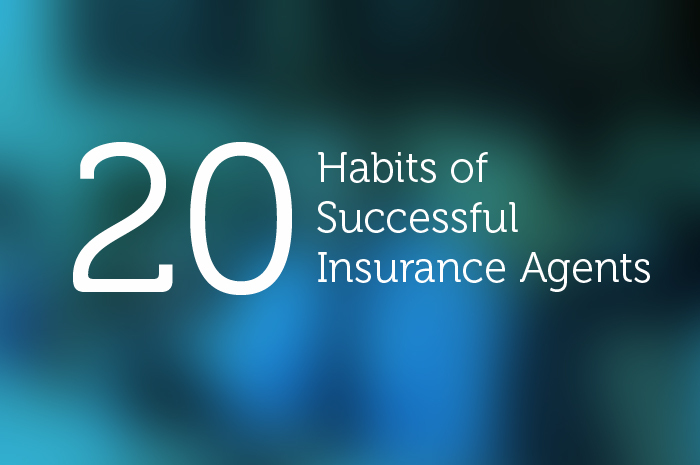 The following are 20 habits of successful Insurance Agents, these habits are not a one time activity. You must make them part of your daily work and personal life. As you look to incorporate these habits into your daily activities, take one at a time and make it a daily activity before focusing on the next. By incorporating these into your life, in time, you too will be a successful insurance agent. 1. Learn to delegate. You can not do everything on your own. Learn to trust your husband, wife, assistant, agents, vendors and others. Growing a successful insurance agency requires a good deal of hard work and if you try to do it all alone, it will be much more difficult and take longer. 2. Trust others. This habit goes along with learning to delegate. You must trust that people you work with, can and will do a good job. You need to trust that the people around you will do what they promise. Without trust, you will be constantly second guessing people and checking up on them. 3. Trust yourself. Be confident and trust your own decision making abilities. Trust that you have hired the right people and vendors/partners to work with. Trust that you can achieve your targets and can grow your agency. 4. Don’t be in a rush. Success doesn’t happen overnight. You will need to stick with it, even if you run into obstacles or feel like you are failing. Success can take time and you should avoid jumping from one strategy to another without giving it enough time. Some insurance agents will buy auto insurance leads and auto insurance calls for a few weeks and then stop, without giving it time to figure out how to make them work. Achieving success with anything can take time. 5. Don’t be afraid to fail. Some of the most successful people fail at a task, activity or endeavor, but then don’t give up and throw in the towel. Learning what doesn’t work is just as important as knowing what does. If you are afraid to fail, you will miss out on opportunities. 6. Establish goals and targets. When you have goals and targets you give yourself something to strive towards everyday. Your goals and targets should be both short and long term and should include ones that have both business and personal elements. Your goals should also be both measurable and achievable. 7. Ask for help. Never be afraid to ask for help and advice when you are uncertain about something. If you are not sure how best to work auto insurance calls and leads, you should ask for help from your vendor, a former co-worker, another successful agent, or even social media. 8. Help others. Just as you should ask for help when you need it, you should be willing to help others when they ask you for assistance. When you help others, you are developing deeper relationships and others will be more than willing to help you in the future. 9. Establish partnerships. Similar to not being afraid to ask for help and helping others, you should partner with others to grow your insurance agency and book of business. You should view all your relationships as partnerships. Some insurance agents view their home or auto insurance lead vendor as an adversary when in reality they should be viewed as a partner and treated as such. 10. Avoid saying “I’m too busy” or “I have too much on my plate.” When you say you are too busy to someone, you are really saying, that isn’t a priority to me or you are not important to me. If you don’t want to do something, just say so or explain why you don’t want to do it. People will respect your honesty. 11. Negotiate. Very little in life is black or white. There are many shades of gray. When you are working with your clients, vendors, employees or others, be willing to negotiate to reach agreement. While it might be earlier to walk away than to negotiate, you will get more done when you are willing to negotiate for things you want or need. 12. Show appreciation. When you thank people for doing business with you, finishing a project or even just being available for advice, you are expressing your appreciation. When people feel appreciated, they will want to help you again in the future. 13. Commit to lifelong learning. It is important to recognize that you do not know everything. Once you recognize this, you should then commit yourself to learning new things and lifelong learning. The world is constantly changing and you should want to keep up with the changes. An insurance agent once told me, “I’m going to retire in a few years, I don’t need to learn how to use real-time auto insurance leads.” He wasn’t exhibiting the habit of a successful insurance agent. 14. Eat right and exercise daily. Eating right and exercising everyday will help increase your energy level, reduce your stress and improve your overall health. It is easy to say that you don’t have the time or are just too busy. What you are really saying is it isn’t a priority for you, when it should be. 15. Build and maintain a good reputation. When you are known as someone who can be trusted and counted on, people will want to do business with you. When you are known as smart and outgoing, people will want to be around you. It is important to have a good reputation with the people you work with, your vendors and your clients. 16. Manage stress. Owning and managing an insurance agency can be extremely stressful. Insurance agents have to balance the needs of the carriers they work with, with the needs of the insured. These needs don’t always align in every situation. While it is impossible to be stress free, it is important to recognize your stress and find ways to manage it so that it doesn’t have a negative impact on your life. 17. Smile and have fun. People like to be around other happy people. When you smile while selling a home insurance or auto insurance policy, people will smile back. Smiling and having fun at work and at home will reduce your stress and will help you to be more successful. 18. Take an interest in others. When you take an interest in others, they will be more willing to want to take an interest in you. In many cases, when you receive an auto insurance lead or auto insurance call, that will be the very first time you will be talking to that person. When you show a real interest in that person and their life, they will be more interested in doing business with you. The same holds true with vendors, employees and others. 19. Meet commitments. Meeting your commitments is one way you can start to build a good reputation. Meeting the commitments you make to your employees, vendors, employees and others will help you to become a successful insurance agent. 20. Work with a sense of urgency. While you don’t need to be in a rush to achieve success, you do need to work with a sense of urgency. Successful insurance agents are active managers and active sales people who are not be complacent or relaxed about achieving their goals and objectives.